CEPESMA Idiomas is my very own personal project. Everyone holds something near and dear, and for me, it is languages. I earned my bachelors degree in education with emphasis in languages from San Agustin National University in Arequipa. My degree program included general education courses as well as translation and interpretation of English, Italian and basic French. In 2001, after several years teaching English to children in bilingual schools in Arequipa, I decided to open CEPESMA Idiomas in order to focus my efforts on what I found most fulfilling: teaching Spanish to travelers. I love the process of teaching and I use an approach that includes both disciplined study, improvisation and storytelling this combination leads to a discovery of what works for each student. I have found it most beneficial to tailor my approach so that the student gains maximum benefit from the class. Also, I find it fascinating to meet and get to know people from around the world and learn about their cultures, languages and traditions. Recently, I have had the opportunity to work with many people travelers interested in ecotourism, and have gotten to know many of the quite well. Many suggested that I expand my teaching services to tourists visiting Arequipa. I invite you to explore my hometown, the wonderful "Ciudad Blanca", and absorb the language and culture of Arequipa. We at CEPESMA Idiomas are here to help you do just that, and more. 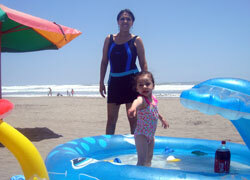 I was born in Arequipa am presently 32 years old, I have a little daughter she is 2 years six months, I am married. I come from a very traditional family, but would like to point out that the customs have not overcome my love for music, food, parties, sports, and other cool things in life. I love to play basketball, and every morning before classes begin, you can find me on the court with my friends. If you are interested in joining a game, the invitation is always open. Not only will you get some exercise, you will also practice your Spanish and get to know some very wonderful people. I hope to see you on the court. I know that when you get to know CEPESMA Idiomas, you will want to come and study with us, play with us, and learn with us. 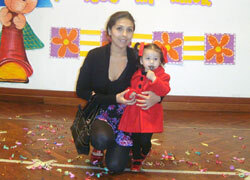 At Cepesma Idiomas, we not only teach the language, we help you immerse yourself in the culture. 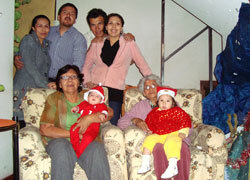 Cecilia, Arequipa and CEPESMA waits for you.